Platinum selling recording artist, world traveler and celebrated hip hop icon Shyne (Moses Michael Levi) continues to make his presence known in the pop and hip hop world light with his recently released 12th anniversary album, Gangland , on his own Gangland Records. The 18-track album represents a significant musical leap forward for the idolized rapper, who had been out of the limelight for several years but has been working full speed ahead on his music during the past two years. "I'm still talking about life on the streets, but I've traveled a long way since my days in Brooklyn," he says, "and this is clearly reflected in Gangland. "It's my most musical album to date and the vision is broader." says Shyne. Shyne's intent for the album was to present a more contrite and conscientious perspective about the life he had been describing in his first two albums. "It's more of a reflection on how I made the decisions I made," says Shyne. "Gangland is more intellectual and introspective. It's an in-depth look at how I came to do the things I've done." 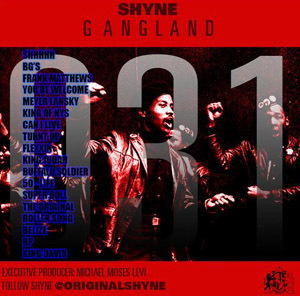 To stream or download the album, please visit http://www.livemixtapes.com/mixtapes/19021/shyne-gangland.html. Shyne references the infamous yet celebrated Brooklyn crime boss Frank Mathews, while describing the fatalistic attitude of forgotten young people who see drug dealing as the only way out of poverty. He reflects on the ironic situation of drug bosses-they know they're ruining lives while they make their money, but they also are giving back by contributing to charitable causes in their community. The way out of this is for America to help the youth, not to judge them. There are two sides to every story and, on this track, Shyne makes the case that what really happened in the 1999 NYC nightclub shooting incident, which sent Shyne to prison for nearly ten years, is still an untold story. Shyne references infamous drug lords Alberto "Alpo" Martinez and Rich Porter to remind us there is no honor among thieves. Shyne titles the song after murdered community activist and Chicago area Black Panther Party leader Fred Hampton, who was wrongfully targeted by a reactionary FBI in the 1960's. Shyne makes the case that deal making may be a bigger priority in our criminal justice system than justice itself. Shyne spent an extended period in Jerusalem after his release from prison. In this Middle Eastern styled song, he brings forth imagery of his and others' lives as incarcerated African American men while he rejoices in his newly found freedom and his determination to be a healer, a giver and a leader. In this track Shyne takes a cue from hero Bob Marley to speak out on the state of the so-called "Post-Obama" era. What does "Post-Obama" mean, he asks? Are we reaching out to our impoverished youth or simply condemning them? Are government leaders worrying about their pocketbooks instead of justice? And he explores the paradox of self-made drug lords: Should they be blamed for enjoying the good life when they've grown up with nothing-or should we call them out for turning their backs when they should be giving back? This haunting track puts Shyne in the shoes of the millions of urban young people stuck in the mire of poverty and isolation. The protagonist's despair and frustration is a warning to us all: things must change. When the game is rigged and people have nothing to lose, breaking the law is not a good thing or a bad thing-it's simply the way to survive. Shyne's long exile in prison began with a single moment. In an instant, his life changed forever. This song shares his regret but reminds us that there may have been some good, too. Good that still isn't acknowledged by those who were part of it. Nevertheless, he reiterates his desire to put it behind him and move forward with his life. Gangland was released exactly 12 years to the day of the release of his first album, Shyne. Back then, as a 19-year old newcomer, his talent was clearly recognized by many, including his mentor, Sean Combs, on whose label the album was released. But no one expected his debut album to garner such acclaim and do so well commercially. Shyne went Platinum (more than 1 million copies sold) and reached number five on the Billboard Magazine Pop Chart and number two on the Billboard Hip Hop chart. His second album, Godfather Taken Alive, on Combs' Bad Boys Records, was released in 2004. It is an extraordinary achievement that he was able to negotiate the record deal, complete and release the album while in prison. The album reached number 5 on the Billboard Pop Chart and number 2 on the Billboard R&B/Hip Hop Chart, and has nearly reached Platinum status. During the past dozen years Shyne has been mostly out of the limelight, but he has remained among the most recognizable artists in hip hop. He continues to be highly respected in the hip hop world and is referenced on notable albums from Combs, Kanye West and Jay-Z. He also has been a featured guest on albums from such artists such as Mase and Kanye West. In 2013, Shyne is an evolving artist whose world view and musical vision have matured since the days of his first two albums," he says. "I see things through a broader perspective. As I grow as a person, my ability to transmit my experiences to the audience grows as well. "I've made mistakes in my life that I'm not proud of, and my goal as an artist and human being is to help other young people avoid making bad decisions that can change the course of their lives. I'm all about compassion, tolerance and the strength of the human spirit." Shyne spends much of his time in Paris, Belize and Jerusalem and devotes many hours to the recording studio. He constantly seeks out opportunities to promote Belize. "I'm working to see it rise from a poor, third-world country to a thriving, developing country," he says. "It's a long-term project and I'm in it for the long haul." Join Connections Chicago for a fun progressive dinner on Wells Street, Thursday, March 7 beginning at 6 p.m. Throughout the evening, guests will be given the opportunity to indulge in some of Old Town’s finest cuisine with stops at The Pour House, Bistrot Margot, O’Brien’s, and The Twisted Baker. The evening begins at The Pour House (1419 N. Wells St.) with appetizers including Miniature Burgers, Chicken Caesar Wraps, and Buffalo Shrimp, followed by French Onion Soup, Bistrot Salad or Chicken Caesar Salad at Bistrot Margot (1437 N. Wells St.). The group moves on to O’Brien’s Restaurant & Bar (1528 Wells St.) for your choice of Irish Corned Beef & Cabbage, Seared Scottish Salmon with Walnut Couscous Salad, Roasted Chicken with Vesuvio Potatoes, or a Stuffed Portabella Mushroom with Mashed Potatoes and Asparagus. The final stop is at The Twisted Baker (1543 N. Wells St.) for dessert including choice of Red Velvet or Vanilla Cupcake, Fruit Tart, Raspberry Cheesecake, or a Chocolate Brownie . Reservations are limited. The cost is $75 inclusive of tax and tip. Register online at http://www.connectionschicago.com For questions, email customercare@connectionschicago.com. This event is produced by ConnectionsChicago.com. Like them at Facebook.com/connectionschicago and register for future mailings at www.connectionschicago.com. The River North Business Association (RNBA) holds its annual meeting Wednesday, February 27 at Rockit Bar & Grill, 22 W. Hubbard Ave. The meeting includes the election of new board directors as well as the announcement of RNBA’s River North’s Best annual award winners. The program begins with registration at 5:30 p.m. and concludes with a celebration reception beginning at 7:15 p.m. Guests are invited to enjoy Rockit Bar & Grill’s hospitality and a motivational presentation by RNBA member Jonny Imerman of Imerman’s Angels. The cost for registration is $35 for members and $40 for non-members. Register on-line here or visit http://www.rivernorthassociation.com or call 312-645-1047 for additional information. New to the River North Business Association’s board, being elected to a two-year term, are: Paul Rudewick, Optimal Facilities Management Services; Liz Schulze, John Barleycorn and Moe’s Cantina; Brian Taich, Mesirow Financial Group; Erica Poppe, Sullivan’s Steakhouse; Joe Virgil, MacMall; and Aaron Zaretsky, Urban Innovations. 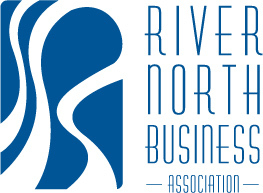 The River North Business Association’s slate of board members being re-elected for a two-year term include: Art Bryan, The Redhead Piano Bar; Robert Gottfred, Erie-LaSalle Body Shop & Car Care Center; Josh Hauer, Rockit Bar & Grill; Adam Havrilla, Artistic Blooms; France Langan, Holiday Inn Mart Plaza; Grace Napalitano, Michigan Avenue Magazine; Mayo C. Walcott, North Ban; and Ryan Wynia, Firebone. The 8th Annual River North’s Best Awards winners also will be announced. This year’s nominees include: Best New Restaurant: Dragon Ranch Moonshine & BBQ, Underground Wonder Bar, John Barleycorn River North, and Untitled; Best Restaurant: Mastro’s, Maxwell’s at the Club, Sullivan’s Steak House, and LaMadia; Best Sustainable Business: Urban Innovations, Merchandise Mart, and Greenheart/Center for Cultural Exchange; Best Entertainment/Hospitality: Cityscape Bar, Paris Club, The Baton Show Lounge, and ZED 451; Best Business/Service: Comcast Business Services, River North Gym, Serpe Insurance, and The Chopping Block. "Everyone will have the opportunity to win great prizes by purchasing door prize tickets," says Sharon Romack, president of RNBA. "Additionally, we are collecting books that are in good condition, either new or used, to donate to Open Books, a literacy nonprofit that collects and sells donated books in their River North store (213 W. Institute Place) to support their transformational reading and writing programs for high-need students in Chicago. We ask that guests bring any book - fiction, nonfiction, children's books, and textbooks." The River North Business Association annual meeting is sponsored by North Bank. River North Association represents more than 275 businesses in the area bounded by the Chicago River to the south and west, Division on the north and Wabash on the east. It's the mission of our Association to promote and support members in every way possible, and to help improve the quality of life within the community. We also work hard to keep River North a top-of-mind destination. The area boasts Chicago’s highest concentration of restaurants and entertainment venues and is Chicago's most exciting neighborhood to live, work, shop, dine and play. For information, contact RNBA at 312-645-1047 or visit www.rivernorthassociation.com. This Valentine’s Day your loved one might be expecting chocolates or a fancy night on the town. But you can give her a lifetime of perfect vision with Lasik from Doctors for Visual Freedom (875 North Michigan Avenue Suite 1550, Chicago, IL 60611; 312-291-9957). With an office in the John Hancock Center on the Magnificent Mile, Dr. Golden is one of the earliest pioneers in the techniques of Lasik, having performing over 23,000 procedures. If she already possesses 20/20 vision then you can help her bring back a more youthful glow with Botox® Cosmetic. For the special price of $12 per unit, women everywhere have been improving their appearance by ridding away extra fine lines. This Valentine’s Day, stop in to Dr. Golden’s office for Botox Cosmetic and learn more about the wonders of Lasik. For an affordable, organic and local dining option for Valentine’s Day, Wisma at the Chicago French Market (131 N. Clinton St., Chicago; 312-382-1805) will be offering holiday savings consisting of 25% off any two dinners when purchased February 13-14. Try Wisma’s featured Vegetable Lasagna ($11) or Shells Carbonara ($9). Vanille Patisserie, the French bakery at Chicago French Market (131 N. Clinton St., Chicago), is offering a variety of Valentine’s Day treats for the big day. In lovely heart shaped pre-packaged Chocolate, Vanilla and Raspberry Macarons are available in sizes of 8 ($15) and 18 ($32) pieces. Vanille’s French Conversation Sugar Cookies ($3 each), Mascarpone Heart Cheesecake ($5.75 serves 1) and heart boxes of handmade chocolates also are available (3 piece $5.95, ½ lb. box $25, 1 lb. box $47). 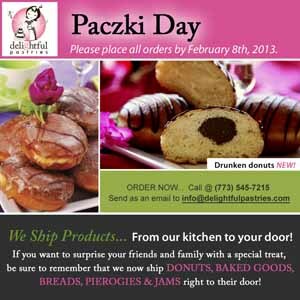 Place your orders at (312) 575-9963. Lavazza Espression at the Chicago French Market (131 N. Clinton St., Chicago; 312-207-0500) is featuring two special Valentine specials, the Strawberry Èspessone™ and a gift with purchase promotion. It’s love at first taste with a fresh and velvety strawberry foam layered over decadent Italian drinking chocolate or a smooth espresso shot. Receive a complimentary “Falling in Love with Coffee” Shopper tote with the purchase of a pound of whole bean coffee ($13.50 - $14.75) through February 14.